« Want to Avoid the Summer Time Brain Drain? Then Check Out the K-12 Reading List from Sylvan! I want to give a big and hearty CONGRATULATIONS to Christian, the winner of the Glow Gifts $50 Gift Certificate! Christian now has 48 hours to confirm! I also want to give a big and hearty CONGRATULATIONS to Kathy, the first winner of the Toothpaste 2 Go Toothpaste Transfer System! Kathy now has 48 hours to confirm! I also want to give a big and hearty CONGRATULATIONS to Jessica, the second winner of the Toothpaste 2 Go Toothpaste Transfer System! Jessica now has 48 hours to confirm! I also want to give a big and hearty CONGRATULATIONS to Rita, the third winner of the Toothpaste 2 Go Toothpaste Transfer System! Rita now has 48 hours to confirm! I also want to give a big and hearty CONGRATULATIONS to Lori, the winner of the ThinkGeek $50 Gift Certificate! Lori now has 48 hours to confirm! 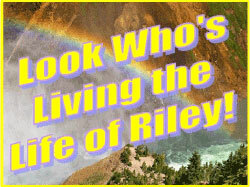 One Response to *** WINNERS *** Christian, Kathy, Jessica, Rita and Lori are Living the Life of Riley! CONGRATS! *** WINNERS *** Heather, Lisa, Jessica and Dawn are Living the Life of Riley! CONGRATS!